Two 11"x25" sturdy cardstock sheets printed both sides in easy-reading black and red ink. 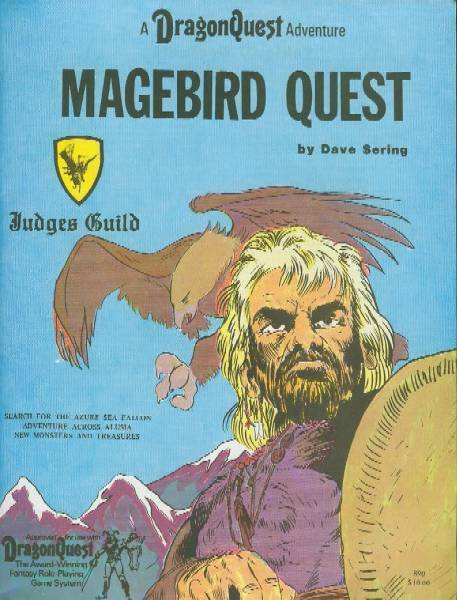 All the combat, magic, monster charts and statistics are carefully abstracted and arranged in the usual Judges Guild efficiency enhancing manner. Colored lines and halftone patterns make it easy to find the required information at a glance. Search for the Azure Sea Falcon. Make a fantastic quest for a rare item which involves a perilous journey o'er land and sea to the rugged crags of the Rookeries. 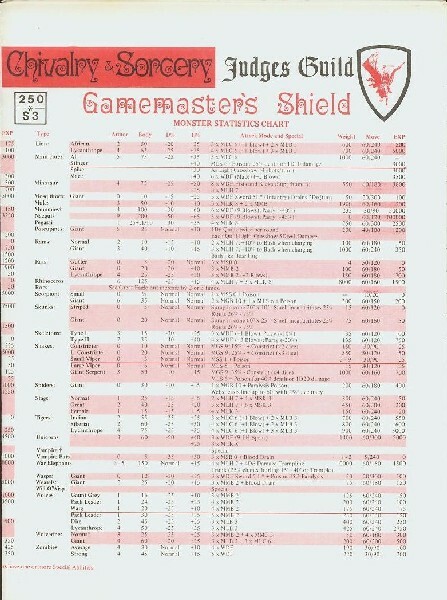 This is a challengin initial adventure to start beginning players into the amazing world of DragonQuest. This scenario contains three completely detailed villages, numberous characters, new monsters, encounters, caravans, brigands, merfolk, pirates, and much, much more. 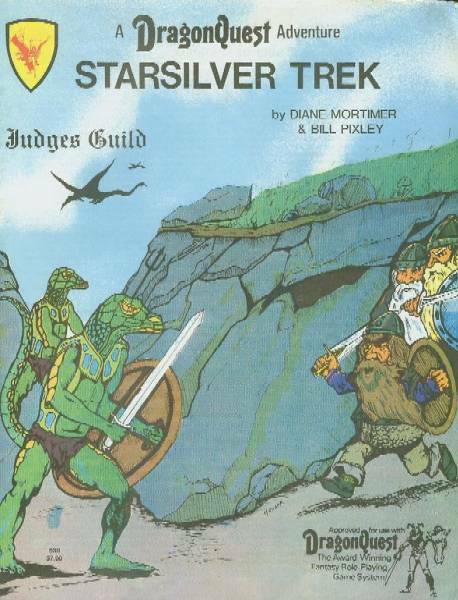 Set in the Frontiers of Alusia campaign map, this 64-page adventure scenario provides new monsters, encounters, and suggested player-characters as well as a suggested new skill. Designed and approved for DragonQuest. The Frontiers of Alusia come alive with this compilation of incredible Alusian citizens. This is a book no DragonQuest Judge should be without. Many personalities are finely detailed herein along with a host of characters of varying importance. Within this book roam such characters as the Lone Hunress who stalks the Filgisio with her Sabre-Toothed Tigers, and Old Gregor the Storyteller, spinning his yarns in the taverns of Seagate. Then there is Aurelia, a soft-hearted Elven Troubador who cannot cure her wanderlust. These and others await your intrepid DragonQuest players as friends, enemies, or just as chance encounters. High in the Barren Hill, o'er the Falls of Valusha, it is rumored, lies the fabled Star Silver Lode. Now, with danger threatening, your Dwarven Clan has sent you and your seven stout-hearted friends to seek out that hoped-for treasure lode. Can your party but return with enough Star Silver, the cunning smiths of the Clan will forge such mighty weapons that your Clan will have an overwhelming advantage in the threatening strife. Go quickly, now! The cry of the Raven on the night wind warns that the enemy may also have heard of the lode and may be, even now, stealing it away! Set in the Frontiers of Alusia campaign map, this 48-page adventure scenario provides new monsters, encounters, and suggested player-characters for use with DragonQuest. 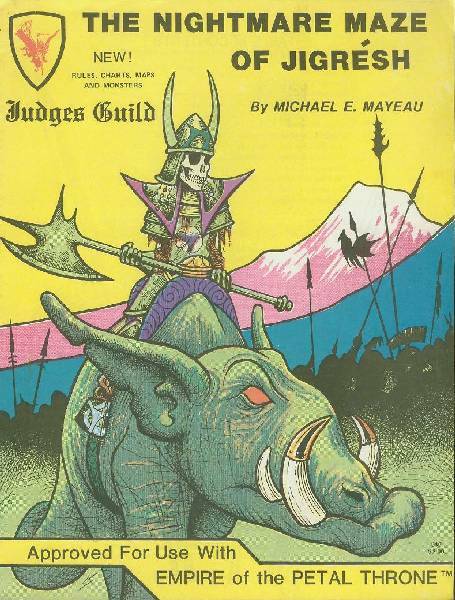 The 16-page booklet for use with the Empire of the Petal Throne rules set is based on the fantasy world of Tekumel. This module takes place in a tortuous maze in a race against time to locate and return with a holy relic. Monster and wandering monster encounters are provided for, along with statistics for Empire of the Petal Throne. It is recommended for use with mid-level characters. Designed and approved for use with Empire of the Petal Throne. 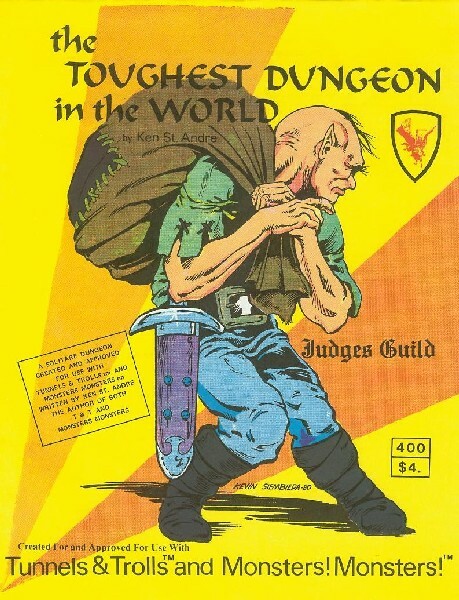 The Toughest Dungeon in the World is a solitaire dungeon approved for use with Tunnels & Trolls and Monsters! Monsters!. 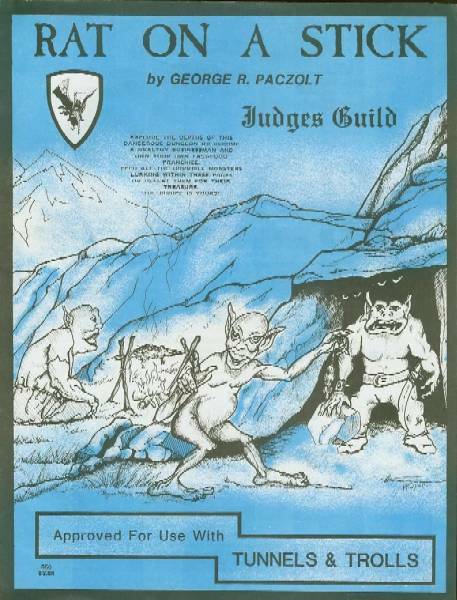 This dungeon is written by Ken St.Andre, author of both Tunnels & Trolls and Monsters! Monsters! An uusual scenario because you can be either a player character (Elf, Dwarf, etc.) or a Monster characters (Troll, Orc, etc.). Explore the depths of this dangerous dungeon or become a wealthy businessmand and own your own fast-food franchise. Feed all the horrible monsters lurking withing these pages or defeat them for their treasure. The choice is yours! 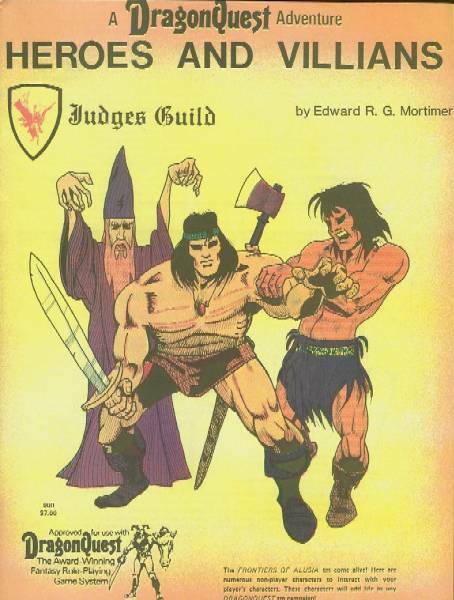 A 32-page adventure detailing 10 dungeon levels of adventure. Designed for use with Tunnels & Trolls. Almost a centry ago, Durenian colonists landed on the northern coast. There, they raised bustling cities under the cooling breezes from the sea, but, except for sailors, traders, and ambitious adventurers, no one ventures far into the fever-ridden, mosquito-cursed interior. Even these are usually content to stay close to the outposts, taking an occasional profit when some of the friendlier Taweii come in to sell their pelts, their medicinal herbs, and some exotic jungle products. You turn and stroll back to the fort. the musical call of the auctioneer catches your attention. He is selling a catch of slaves that a party of adventurers just brought back from the wilderness. Yet, they came back disappointed; like you, they had heard rumors of great wealth waiting to be found in the jungle, ruinded cities rich in grave goods, undiscovered civilizations, fountains of youth, and the bountiful graveyards of the giant, ivory bearing beasts. 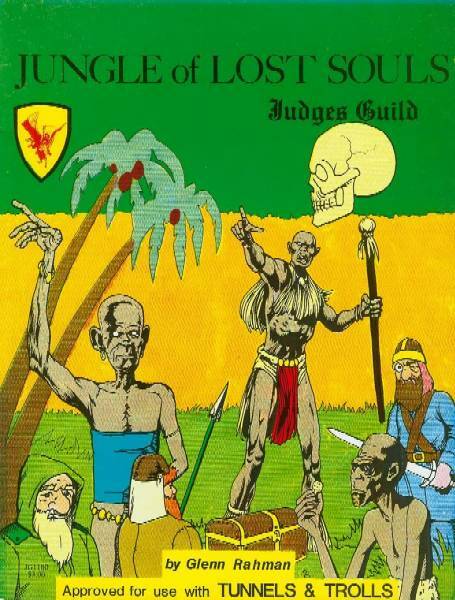 You have already decided to try your luck in the forbidding jungle. This is a 28-page solo adventure designed for use with Tunnels & Trolls. 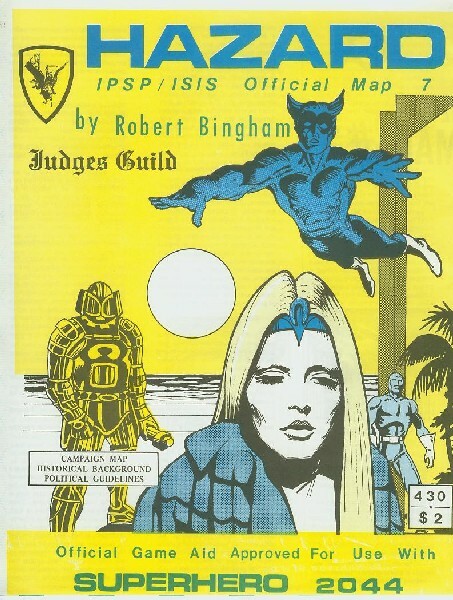 This is Judges Guild's first gaming aid for the SuperHero 2044 role-playing system. It comprises a 22"x34" three color map of the Pacific Ocean area after the hypothetical Six Day War. Background information on the politics, history and societies of this new world is given in the IPSP/ISIS special guide to the Official Hazard Map No.7. data on the wild life hazards of Australia is featured, including the Australians themselves. This product provides the background setting necessary for initiating a comprehensive campaign. 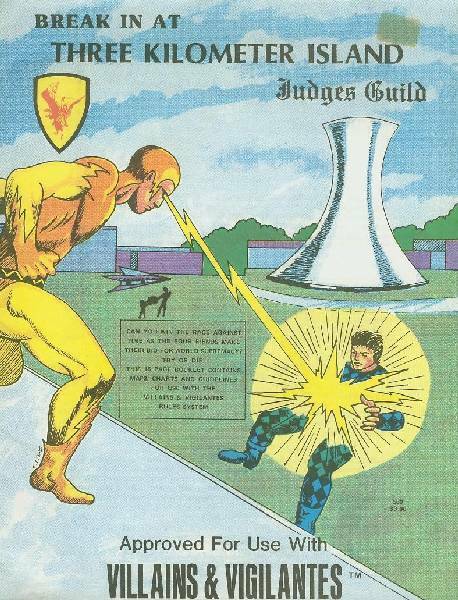 This is approved for use with SuperHero 2044. This module for the Villians & Vigilantes role-playing system is designed for use with lower level characters. Packed full of maps, charts, and of course, villians, its 16 pages are ready to provide hours of action-packed enjoyment.